One of the first exercises that we did in painting class was a visit to blind contour drawing. We had to draw each other without looking at the paper, and of course that always has some rather interesting results. Then we had to take our drawing and transfer it to canvas and paint it. Our instructor actually encouraged us to push the boundaries even more and use strong colors, so I ended up wiping off the face and attempting to re-do it in our next session, but didn't get very far. I was originally not going to post this painting because it's really not the type of style I paint, but it was such a perfect illustration of Illustration Friday's "Vacant" theme that I decided to just get over it and post it. 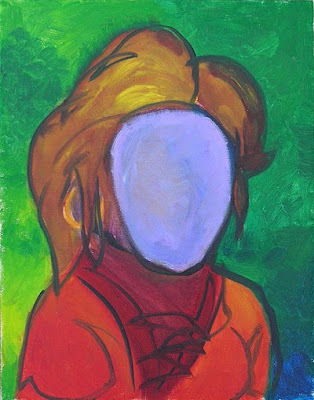 I've been thinking about adding a pair of eyes to the original painting and call it "Eyes Without A Face" after the Billy Idol song. It's painted in oils on canvas. The colors are rich and strong lines.